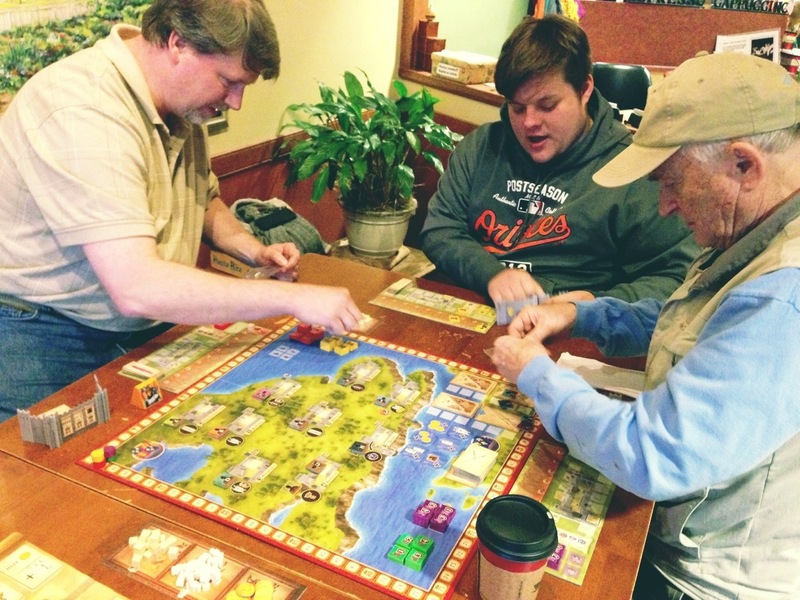 (Left to right) Danny, Joey, Frank, and I (not pictured) play a game of Lancaster during our weekly game night at the coffee shop. Several months ago, my friend Frank Hamrick gave a presentation at his church on his 2011 trip to Turkey and Greece to study early church history. The map of the ancient city of Ephesus and the slow movement of its harbor over time immediately suggested to me possibilities for a strategy board game. Since then, I’ve been pondering and making notes as ideas have come to me. I spent some time on it again tonight, and I feel that I made significant progress toward a clearer vision of the objective and the mechanics. The movement of the harbor due to the influx of river sediment effected in some part the decline of the Ephesian popularity and economy. This suggested to me a timing mechanism for the game as well as a tool for regressing the commerce in the city. The various buildings on the map of ancient Ephesus, such as the market, theater, civic center, and library, offered avenues for a variety of methods to gain points. I imagined the possible ways these various sectors might affect each other and provide alternate strategic paths. Although my current designs don’t focus on the apostle Paul’s activity in the city, the influence of his ministry there provided an opportunity for a persistent threat mechanic to challenge the players stratagems. According to Acts 19, when the silversmiths who crafted shrines for Artemis (Diana) felt that their livelihood was threatened by the number of people converting to Christianity, the silversmiths started an uproar. The town clerk, fearing that Rome might come in force to quell a riot, quieted the crowd and encouraged them to take their grievances to the courts. Shortly after this, Paul departed Ephesus. The notion of Roman forces coming to quash a potential uprising gave me the idea of having safe, non-threatening player actions as well as dangerous but more profitable actions that might incur Roman retaliation. So, the players would have to decide whether to play it safe and accumulate long-term benefits or to risk Roman wrath for more immediate and substantial gains. I don’t want to go into too many details here and possibly give away the design, but I think I’ve come up with some really interesting game play possibilities and strategic options. I’m looking forward to discussing the details sometime with Frank who is also an avid gamer and was responsible for my introduction to European-style strategy games. My brother Brent is a mathematician and has studied game theory, and I also look forward to discussing game mechanics with him. I feel that things are really starting to come together for this game. Hopefully, I’ll be able to have a workable rough draft for some playtesting within a few months. I’m really excited about this!